Probably every body's least favorite, but one of the most important aspects of an eBay business is SHIPPING. Here's the list of suppliers that I use for my shipping needs. Anybody who knows of any cheaper options (not quality wise) let me know and I'll thank you somehow. I am sure eBay has some better deals, post them here!!!!! Of course for Priority Mail I use the free USPS boxes and print my own postage online. There are many options for this. I use Endicia Premium $15.95/month 30 days free trail. I would get so frustrated when I had to wait online at the post office, especially my local branch which I won't list here, but I believe might be one of the worst in the U.S. We'll save some bad Post Office Stories for another time & another post. I couldn't imagine waiting online anymore especially on a day like today, the busiest shipping day of the year. Uline has every size available and will have them delivered the next day if you order by 6pm. So far so good with them. Staples Brand 6 pack clear long lasting packaging tape $29.99 6 rolls 48 mm x 100/roll (in English that's a good amount of tape). Good quality tape. Staples Brand 3/16-inch 12 in x 200 ft rolls. $19.99 each. Perforated every 12" perfect for my Car Hats. Staples Packing Paper, 25-lb. Box - Approx. 400 Sheets $29.99. I love this stuff, I use it to wrap everything, plus it's made from 100% recycled paper. I get my shipping labels off eBay. My favorite seller is selldog1234. Good deals & fast shipping. 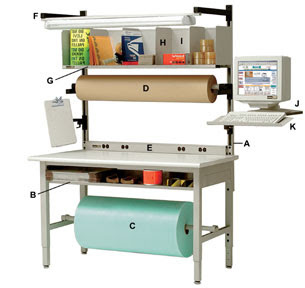 BTW... how sweet does that packaging station up top look to us eBay sellers. I'm thinking about it.